Alongside slinky jersey dresses, luxe tailoring and some inventive outerwear and gowns, Tom Ford presented some of his best suits of all time last night. It was also an emotional collection for the designer. Drawing from his own feelings of the moment, he said in a statement, "The chaos and the negative climate of the times in which we are living made me long for clothes that are gentle, not aggressive and have a certain simplicity. That outward simplicity, however, is created in a highly labor intensive manner as garments are lined and faced in silk and a great deal of handwork is used to create the seemingly simple silhouette, and in many cases the true luxury of the garments is hidden in their construction." Along with that, the designer used a brighter color palette as inspired by his L.A. lifestyle. Here's everything you nee to know about the show. We all know that Tom Ford does a classic suit well, but this season saw several iterations of new, spectacular takes on all the classics. 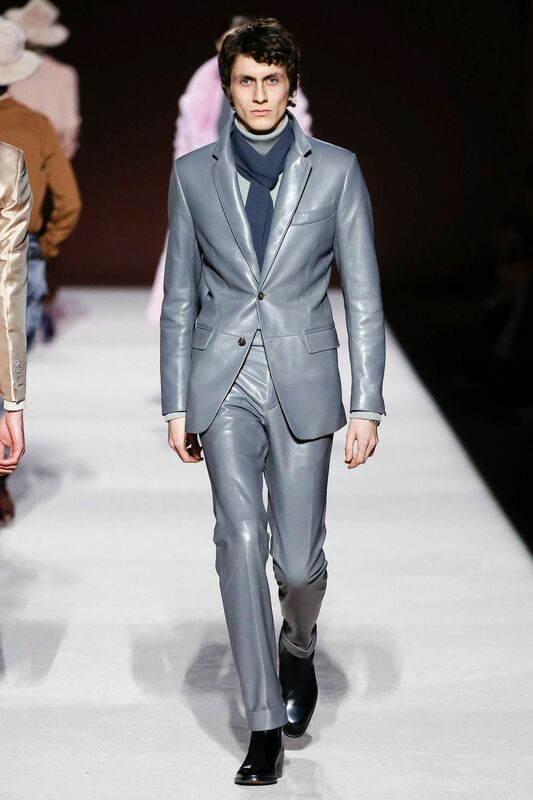 Take, for example, a sharp cut gray leather suit for men styled with an elegant navy scarf. There was also an all-black leather suit that was a standout. Long jersey gowns got a total revamp with the addition of chunky metal chains. Whether strapped across the shoulders or stretched across the décolletage, the effect was impactful for both form and function. Why wear a necklace when the accessory is already built in? And with awards season in full swing, these pieces were practically made for red carpet moments. Tom Ford's NYFW show is always an opportunity for front row celeb sightings, and this season was no exception. Spotted at the show were Courtney Love, Ansel Elgort, Sebastian Stan and Patrick Schwarzenegger just to name a few. Like we said, almost no one does a suit better than Tom Ford. 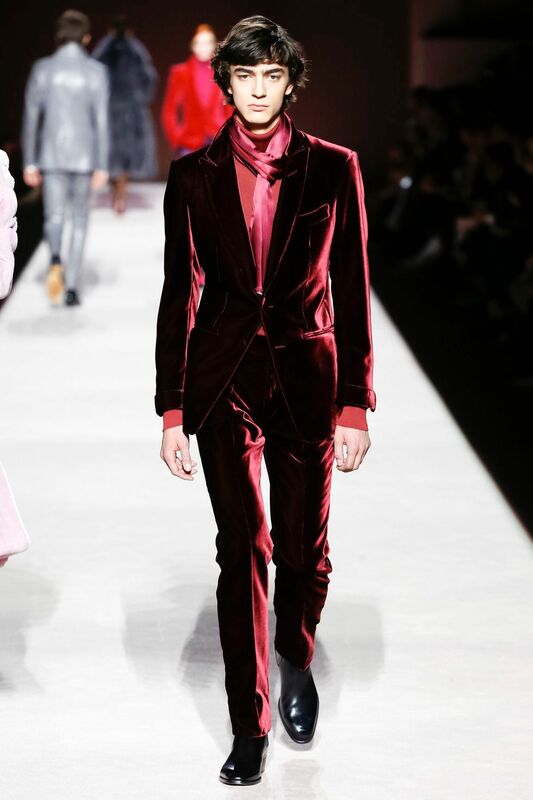 This season, they came in burgundy velvet, printed with abstract black and white patterns and even styled with rugged puffer jackets. This gave the collection a slight hint of streetwear hype. As the show began, the first three looks were styled with major, pastel-hued fluffy fur hats. Think: the same kind of hat made popular by the leader of the English funk-jazz bank, Jamiroquai. 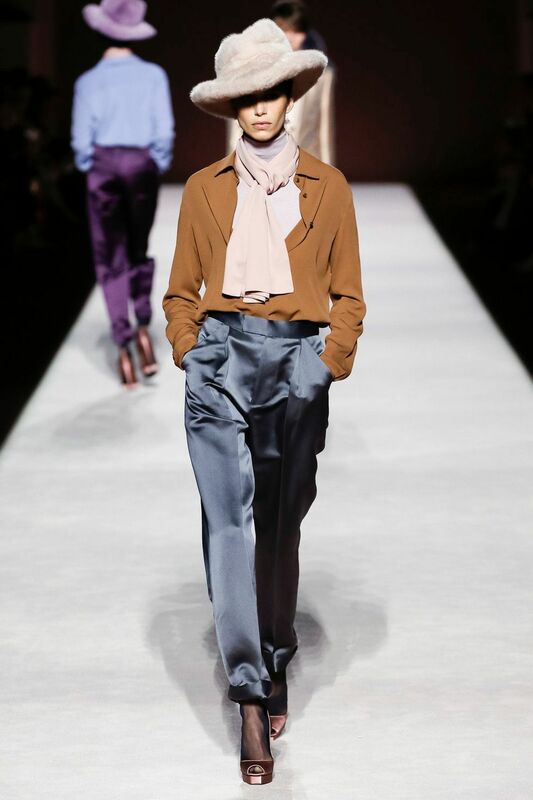 It might sound comical, but the way Ford did it; with slinky '70s style cardigans worn over tight turtlenecks and contrasting cashmere scarves, plus boxy trousers, it became much more wearable and chic than anything else. These hats adds a playful punch throughout the collection.